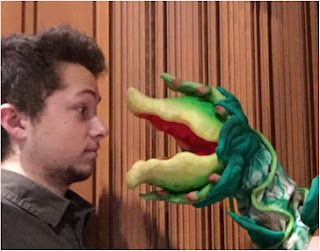 Hofstra Pride Guides: Peter is a Plant Puppeteer Director! Peter is a Plant Puppeteer Director! My name is Peter Charney, and I'm a senior BFA theatre directing major. This fall I have had the wonderful opportunity to be the Director of Puppetry for The Hofstra Department of Drama and Dance’s production of Little Shop of Horrors. If you don’t know the story, Little Shop of Horrors is about Seymour, a florist shop worker, who raises a monstrous plant that feeds on humans. The plant, nicknamed Audrey II after Seymour’s love interest Audrey, is portrayed onstage by a series of puppets ranging from about 8 inches tall to the final puppet, which stands at approximately 10 feet! There are three puppeteers who operate the various plants and one actor who is the voice of the plants. My job is to combine those elements to bring this character to life in a way that is very realistic. For more insight into the process of creating the character of Audrey II: Puppeteer Interview! We hope you come see the show this weekend! Remaining show dates at Hofstra are Friday, October 28 at 8 p.m.; Saturday, October 29 at 8 p.m., and Sunday, October 30, at 2 p.m. Members of the Hofstra community receive two free tickets upon presentation of a current HofstraCard. Tickets: $15; $12 senior citizen (over 65) or matriculated non-Hofstra student with ID. For tickets, call the Hofstra Box Office at (516) 463-6644 or visit www.HofstraTickets.com.